Harry Kane ended his August goal drought as Spurs defeated Fulham at Wembley in the Premier League on Saturday afternoon. Lucas Moura scored to give the Lilywhites the lead just before half time, but his goal was cancelled out by Alexsander Mitrovic. 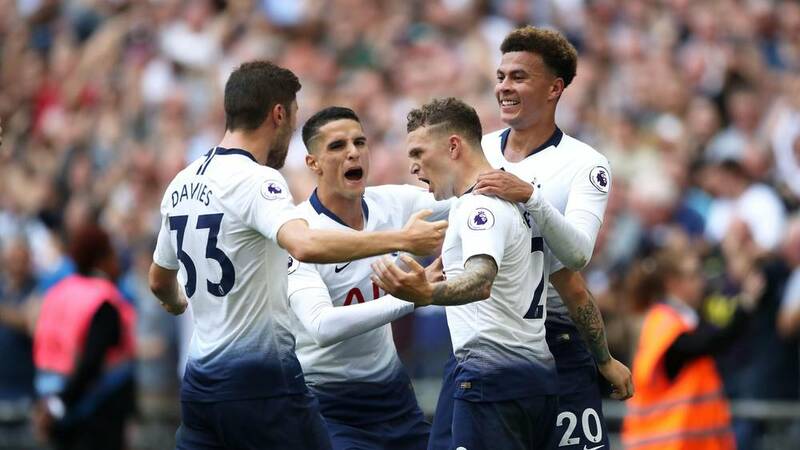 Spurs rallied with two goals in quick succession as Kieran Trippier whipped in a free-kick, whilst the English striker finished Fulham off. The win for Tottenham was the club’s second win from the opening two matches, whilst the newly promoted Cottagers remained pointless. Spurs manager Mauricio Pochettino changed his formation after the Newcastle match: He opted to drop Moussa Sissoko and recall Toby Alderweireld, who fitted into a back three alongside Jan Vertonghen and Davinson Sanchez. Trippier also came back into the team ahead of Serge Aurier. The first notable moment of the match involved Kane who put the ball into the back of Fabri’s net, but it was disallowed after Lucas was penalised for a foul on the goalkeeper. The rest of the first half saw only a few chances for both sides, but Spurs were able to take the lead just before the start of stoppage time. Fulham could’ve scored just before though, as Ryan Sessegnon’s effort was expertly saved by World Cup winning Hugo Lloris. At the other end, Spurs took the lead through Lucas. Trippier was involved down the right, as he played a lofted ball in towards Christian Eriksen. The Danish international played the ball back inside, but it was cut out towards the Brazilian on the edge of the area. He then whipped a curling strike into the top left-hand corner to score his first ever Premier League goal. Fulham started the second half brightly, as Mitrovic drilled the ball off the post. However, the Serbian wasn’t to be denied, as he equalised only a few minutes later. Joe Bryan whipped in a cross towards the back post looking for Sessegnon from the left, and the youngster calmly directed the ball back into the six-yard box in a central position. Mitrovic nodded the ball home with his head, from close range. Tottenham began to pile on the pressure, as Dele Alli came close and Kane saw his effort hit the crossbar. Although, they quickly took the lead again. Kane and Alli were involved, as the young midfielder won a central free-kick, from 30 yards out. Memories of Trippier’s excellent free kick against Croatia in the World Cup semi-final came flooding back as he whipped in another stunning free kick. He curled the ball beautifully into the left-hand corner to send Spurs fans into celebration. The club doubled their lead only minutes later as Kane, fresh from winning the World Cup golden boot, secured the victory. The goal was the Englishman’s first ever goal in the month of August for Spurs, after 15 matches. Substitute Erik Lamela picked out the striker in the penalty area, on the left. He cut inside and guided the ball low into the bottom right hand corner. The victory ensured that Spurs have picked up six points from a possible six at the start of this season. After a week of uncertainty at the club following the recent news that the stadium move will be delayed, alongside the lack of signings, it was vital that Spurs started the season well. They have done exactly that, and will travel to Old Trafford full of confidence.